Deciding that late is better than never when it comes to jumping aboard a lucrative bandwagon, MGM have this week optioned the rights to turn J. Michael Straczynski’s super-hero comicbook Rising Stars into a movie, hoping perhaps that audiences have at least a few more years of tolerance for the spandex and capes set in them yet. No stranger to the film business having lent his pen to Marvel Studios‘ Thor and Paramount’s World War Z, JMS is set to write the script himself with Alex Gartner and Richard Suckle producing for Atlas Entertainment. 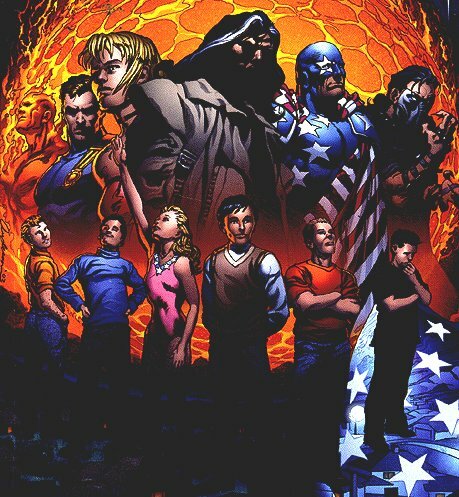 Released as a mini-series in 1999, Rising Stars follows the lives of 113 men and women who, before they were born, were exposed to an unknown radiation when a comet fell to Earth in the outskirts of their small town, USA, The story is told in flashback by the last of the 113, a man named “Poet”, still alive many years later and covers how the children went from local oddities to government research subjects, to full-blown super-heroes and -villains and how their presence on the world stage changed everything. In the comics Poet is forced to abandon a life of solitude when it is discovered that when one of their number dies, their power is shared among the survivors, and heroes and villains alike are starting to turn up dead as one of the 113 makes a play for ultimate power. Bringing new twists to a familiar genre, a Rising Stars movie is something to get very excited for, even if it manages to only capture a fraction of the brilliance of the comicbook.